Alexander Hamilton first came into my life in 1976, when I was beginning a study in depth of the American Revolution. Being particularly interested in the economic foundations of our nation, I delved into Hamilton’s four crucial reports—the first two on public credit, the defense of the National Bank, and the Report on Manufactures. That body of writing—which I’ve had the occasion to come back to many times since—revolutionized my view of our nation’s beginnings. I believe that if our nation’s political and economic leaders would study them today, we could actually put our nation back on the path to progress which Hamilton (with President Washington and others) envisaged. The Report on Manufactures was the most stunning revelation to me, in both its literal content and its implications. In my subsequent many writings on Hamilton, as a journalist and author, I often referred to it as the “Rosetta stone” of all his economics. The particular statement which stood out to me was the one which leads off this essay. What it conveyed to me, and was reinforced throughout the document, was not only that the standard view which reduces the cause of the American Revolution to a “tax revolt” was hogwash, but that there was a noble concept of man, and how he produced wealth, which was the conscious intellectual foundation for the founding of the nation’s economic system. In further study, it became clear to me that Hamilton’s fiscal and economic system depended upon the concept of promoting the productive powers of labor through the development of increasing power over nature (mechanization). This was the purpose of creating a sound credit system, of wedding the interests of the moneyed class to the government, and ensuring steady progress in living standards. From this goal came the need for the government’s role in promoting the general welfare, supporting crucial industries, subsidizing innovation, and facilitating the creation of crucial infrastructure. It was from this moral standpoint that Hamilton abhorred slavery and the Jeffersonian slave system, and fought at great risk to ensure that a national, not regional, system of economy was established. My own studies led me to look into both the background and continuation of Hamilton’s economic ideas. I found particularly fascinating the influence of the Leibnizian Swiss philosopher Emmerich Vattel’s thinking on his view of national economy, as well as of law. 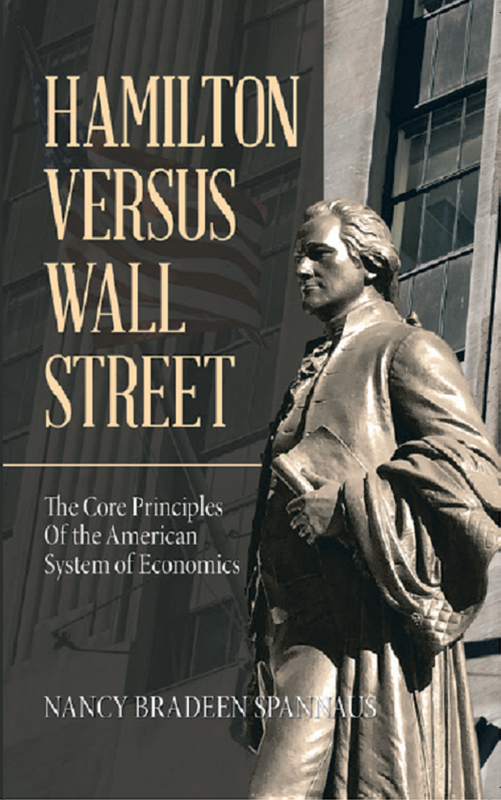 The thread of Hamilton’s influence into the future growth of the United States takes us through the work of Mathew and Henry Carey , into the creation of the “American System” of economics. When you recall how Abraham Lincoln summarized his political program—the national bank, the tariff, and internal improvements—you can’t help but to see his debt to the concepts of Alexander Hamilton. The author’s book, which features Hamllton’s Report on Manufactures. (photo by Philip Ulanowsky). It also became clear to me that Hamilton’s economic concepts could not be separated from his extraordinary defense and shaping of the Constitution. Hamilton knew early on that the right economic policy was the key to winning the war for independence, and holding the nation together. He expressed this in his April 30, 1781 letter to Robert Morris: “’Tis by introducing order into our finances—by restoring public credit—not by gaining battles, that we are to finally gain our object.” Without the national economic system which Hamilton shaped, and the agro-industrial economic progress which that system was geared to promote, the United States would be shattered. Over the last year and a half, being retired from full-time editing, I have had more time to delve back into Hamilton’s writings, especially in his later life. His incredible determination to fight to preserve the nation, no matter the cost to his health, his fortunes, and his reputation, never ceases to be inspiring. That energy can only have come from a deep commitment to the ideas and ideals of the future which he had devoted his life to creating with his economic system. He was willing to risk all to prevent the nation from failing. I think it’s quite possible that his reasons for submitting to his fatal duel, which he had every reason to believe would kill him, came from his belief that the result would destroy the man whom he considered one of the greatest threats to the nation, the “embryo Caesar” Aaron Burr. I have much more to learn from Hamilton, and, at my age, perhaps not that much time in which to do it. My hope and intent is to write a book focused on his economic genius, which puts him in the context of his predecessors and followers, and makes accessible the core economic concepts which we so vitally need today. If others could be stunned into rethinking their idea of economy the way I was when I first read the Report on Manufactures, the Report on the National Bank, and the ( largely Hamilton-authored) Washington’s Farewell Address, I believe we could change the life and direction of our nation for our good, and the good of all mankind. Thank you Nancy: I am on Chapter 2 of A Self-Made Man. I took advantage of two lesser known Land Grant Universities; Prairie View A&M and Langston University in my second career as a Dairy Goat Farmer. Adam Smith; “Sustainable Agriculture is the sole source of revenue and wealth of every nation,” was my economics teacher. American farmers only made money from the end of slavery to WWI and Henry Ford’s Farmall tractor. What were Hamilton’s thoughts on Agriculture? Hamilton did not agree with Adam Smith, but he valued agriculture as a crucial part of an agro-industrial economy. He saw agriculture and manufacturing each increasing the productivity of the society as a whole, and fought hard to try to avoid the farmer v. city conflict which the British, for example, were fostering to try to subvert the revolution. Washington agreed with Hamilton and was heavily involved in trying to modernize agriculture, along with building up a manufacturing sector–which sector, of course, Adam Smith didn’t want to exist in the colonies. Britain wanted to maintain the monopoly on finished manufacturing products (recall the iron act, etc.) and have the colonies just export raw materials to them. You will find the fullest discussion of Hamilton’s views in the Report on Manufactures.